SIIG's Wireless Extra-Duo Keyboard & Mouse Combo is designed to bring you quality performance with the convenience of wireless operation. It supports 2.4GHz RF wireless connection with operating distances of up to 33ft for both keyboard and mouse. Our gaming inspired design keyboard features 104-key QWERTY keyboard layout providing tactile typing comfort and efficiency. 8 built-in hot keys allow quick and easy access to internet, e-mail and multimedia controls. The 6-button high resolution optical scroll mouse enables smooth scrolling maneuver, plus the 3-level adjustable DPI control allows precise cursor tracking. 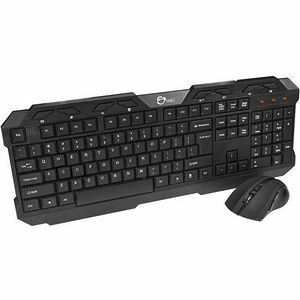 This wireless multimedia keyboard and mouse duo makes a great combination set for general computer operations and other applications including gaming and graphic editing.